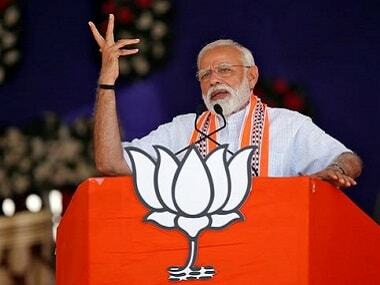 Reacting to the raids on Kamal Nath's associates, Prime Minister Narendra Modi on Monday in an exclusive interview with Network18 editor-in-chief Rahul Joshi asked why no action be taken against scams and corruption. "I didn't raise the finger against corruption, corruption is an issue for us. Just see what happened in Bhopal. 'Bhrasht' Nath can say anything but it doesn't matter (reference to Madhya Pradesh chief minister Kamal Nath and the I-T raids on his close aides). Shouldn’t action be taken against scams and corruption?" asked Modi. 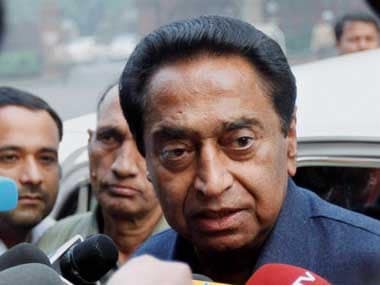 The Income Tax department on Sunday launched pre-dawn raids at 52 locations, including in Delhi and Madhya Pradesh, against close aides of Madhya Pradesh chief minister Kamal Nath and others on charges of tax evasion and hawala transactions, officials said. According to a press release from the Ministry of Finance over 300 I-T officials participated in the operation in the three states. Officials from I-T department and state police swooped down on the premises at around 3 am and recovered undisclosed cash amounting to Rs 10-14 crore, they said. Sources added there is a "strong possibility" of this cash being used as an election inducement to fund political campaigns and bribe voters in the poll-bound state and in Delhi. A preliminary report of the raids has been shared with the Central Board of Direct Taxes, the policy-making body of the I-T department, and the Election Commission in Delhi, the sources told PTI. The recovered cash figure continues to build up and more note counting machines are being arranged in Bhopal, they said. The search operation is being carried out by the investigation wing of the department in Delhi with assistance from its units in Bhopal and neighbouring Raipur. Sleuths used buses, auto-rickshaws and taxis to fan out in the state to keep the surprise element intact, they added. The raids are linked to the suspected movement of hawala money during the ongoing poll season and tax evasion, they said. Locations in Indore, Bhopal, Goa and Delhi (Green Park) were raided and included Nath's former Officer on Special Duty Praveen Kakkar, former adviser Rajendra Miglani and executives linked to his brother-in-law's firm Moser Bayer and his nephew Ratul Puri's company, officials said. 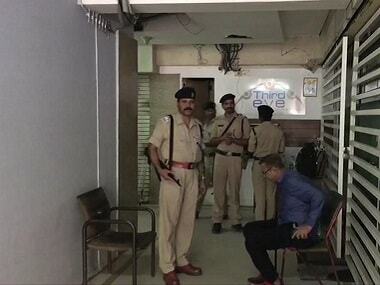 Locations in Ahmedabad are also among the total of 52 premises being searched. The properties linked to Ashwin Sharma, allegedly associated with Kakkar, in Bhopal's Platinum Plaza residency were also covered during the operation. Both Kakkar and Miglani resigned from their posts just before the dates for Lok Sabha polls were announced, officials said. In Indore, the raids were conducted at Kakkar's residence in Vijay Nagar area and other places linked to him, sources said. Searches were also conducted at Kakkar's house in Bhopal's Nadir Colony and a couple of other places in the state capital, they said. Officials said documents related to undisclosed transactions worth Rs 281 crore are being scrutinised and a number of them have been seized. 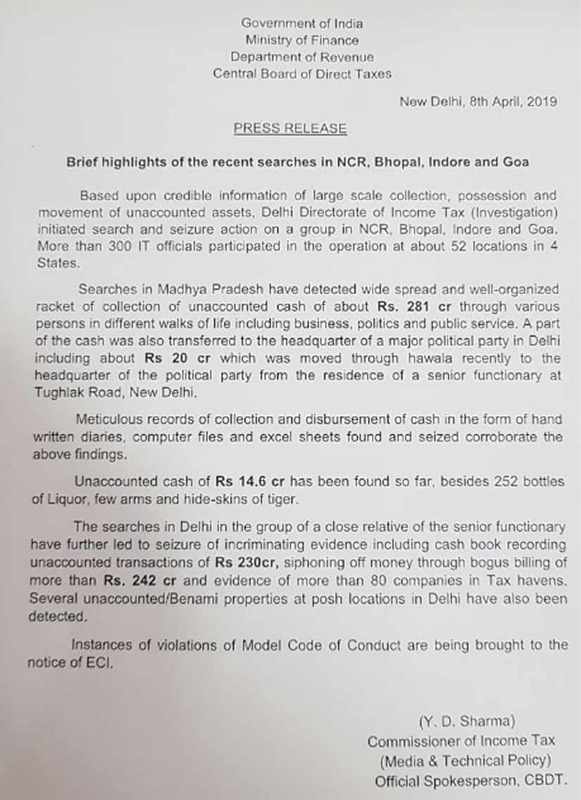 "Searches in Madhya Pradesh have detected widespread and well-organised racket of collection of unaccounted cash of about Rs 281 crore through various persons in different walks of life including business, politics and public service. A part of the cash was also transferred to the headquarter of a major political party in Delhi including about Rs 20 crore which was moved through hawala recently to the headquarter of the political party from the residence of a senior functionary at Tughlak Road, New Delhi," the release said. A total of 252 liquor brand bottles, firearms and hide-skins of tiger have also been recovered from some premises being raided, they added. The raids are also being conducted against Kolkata-based businessman Paras Mal Lodha, the sources added. Lodha was arrested by Enforcement Directorate on money laundering charges post demonetisation. "The searches in Delhi in the group of a close relative of the senior functionary have further led to seizure of incriminating evidence including cash book recording unaccounted transactions of Rs 230 crore, siphoning off money through bogus billing of more than Rs 242 crore and evidence of more than 80 companies in tax havens. Several unaccounted/Benami properties at posh locations in Delhi have also been detected," the release said. The department, this time, had a tip-off about Lodha-linked operatives making hawala transactions in connection with a money laundering case being pursued against Nath's brother-in-law Deepak Puri, they alleged. Kakkar, a former Madhya Pradesh police officer, was appointed OSD to Nath after the Congress-led government came to power in the state last year. He served as OSD to former Union minister Kantilal Bhuria during the UPA government. Bhuria is contesting this Lok Sabha poll from Ratlam-Jhabua seat in Madhya Pradesh. Kakkar's family is associated with a number of businesses, including hospitality. Ratul Puri was last week grilled by ED in Delhi in connection with a probe into the controversial Rs 3,600 AgustaWestland chopper deal. Reacting to the raids, a Congress leader in Madhya Pradesh accused the BJP-led central government of targeting opposition leaders for "political vendetta". Madhya Pradesh Congress's media cell vice-president Bhupendra Gupta, also a former OSD to Nath, charged, "The BJP government has been targeting opposition leaders across the country due to political enmity. Due to such act of political vendetta, Andhra Pradesh Chief Minister (N Chandrababu Naidu) and DMK leader MK Stalin had to stage protest against the Centre." The BJP hit back saying thieves were now having a complaint against the 'watchman'. "Black money worth crores was recovered during the Income Tax Department's raid at the house of the private secretary of Madhya Pradesh chief minister Kamal Nath.